SOLD OUT Please sign up for the mailing list on the blog to be alerted when next month’s classes are announced. Thanks! In 2015 I’m planning to teach one weekend a month. The specific dates are decided about a month in advance. Once the dates are selected I will send out an email to my mailing list (sign up on the blog page: here). Then the dates and class info will be posted below. Thanks for your interest!! Both Calligraphy 101 classes are currently full. Join the mailing list on the upper right corner of the blog to get next month’s class announcement. Thanks! 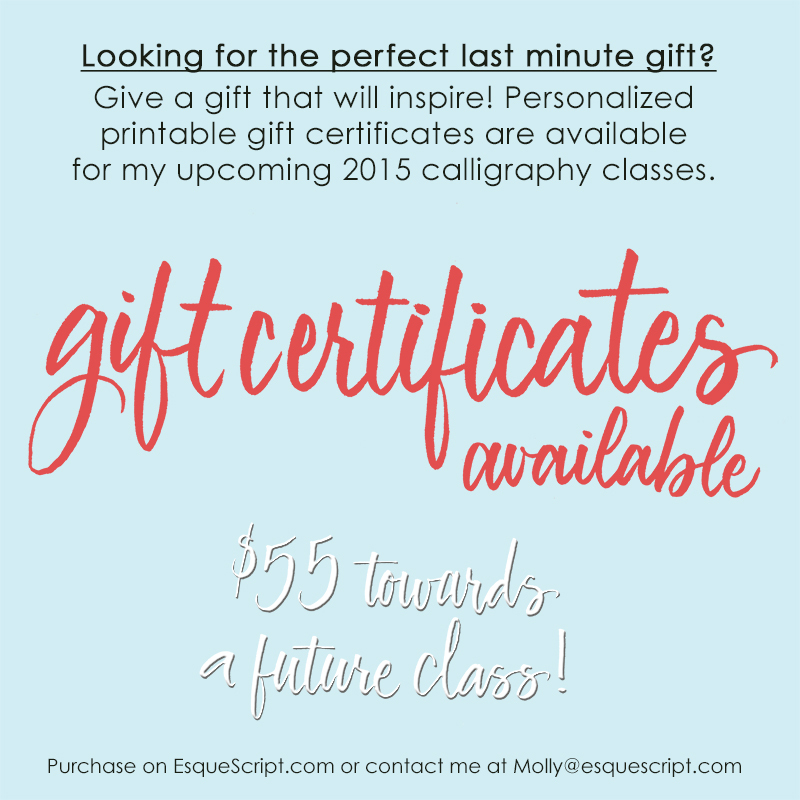 New calligraphy classes for the new year! I’m happy to share the dates for my January/February calligraphy classes! I will be offering two calligraphy 101 classes. One on Saturday morning and the other on Sunday morning. (There will be no Saturday afternoon class.) Hope you’ll be able to join us! This class will be a one day workshop from 9am-1pm. Both classes have sold out! Sign up for the mailing list on the blog to be first to know about next month’s classes! It’s that time of year again! The cold weather has arrived and it’s time to surround ourselves with friends, family and winter festivities. The holiday season is one of my favorite times of year. I love how it’s filled with so many opportunities to be creative with calligraphy. 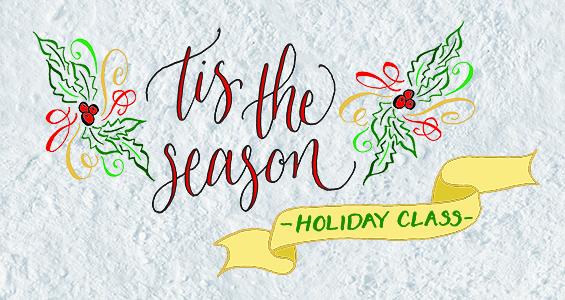 So I’ve decided to host a special holiday class to share projects you can easily make or do to celebrate this winter! Because this is a special class we will be experimenting with casual and modern calligraphy styles. We will use a variety of tools, inks, papers and other supplies. Everything you need will be supplied for you. Both classes have sold out. Since this is a one time offering please email me to be put on a waiting list if desired. Thanks! I’m happy to share the dates for my November calligraphy classes! I will be offering two calligraphy 101 classes and a brush lettering class. This is a great time to learn a new skill that you can put to use during the holidays! Hope you’ll be able to join us! 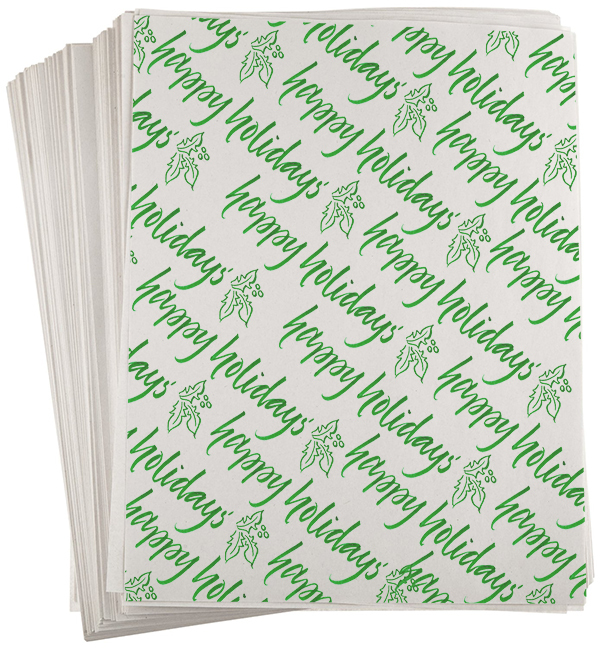 SOLD OUT – More classes coming in Dec! 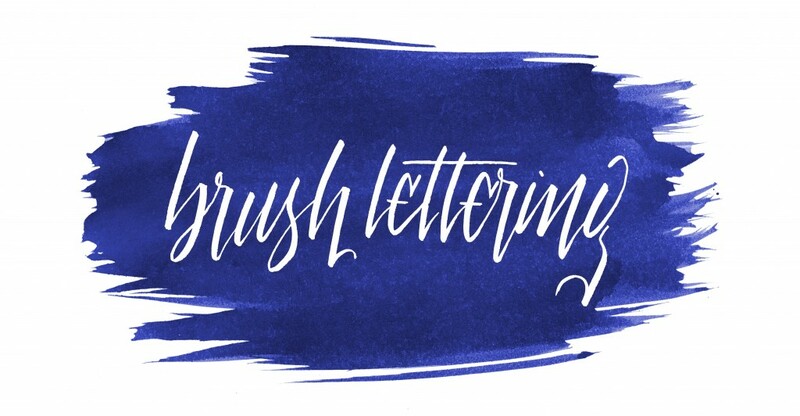 Come explore the world of brush lettering! 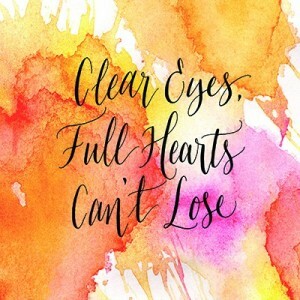 In this class we will look at the many lettering effects and styles you can achieve using brushes and brush markers. We will cover a full brush alphabet, letter variations from edgy to flowy and a few basic illustration examples using a brush. 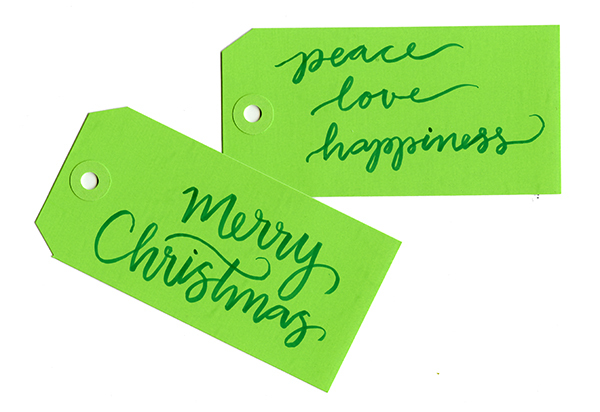 Using tools from markers to paint brushes you’ll create new letterforms with ease. 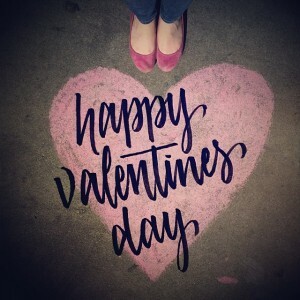 Personally, brush lettering is one of my favorite types of lettering. 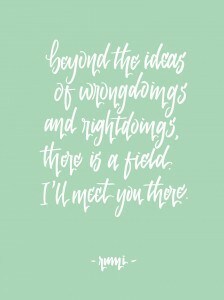 It allows you to create similar looks to traditional and modern calligraphy without needing more than a pen and paper. Sometimes I’ll use brush pens to sketch out designs before I even pick up a penholder and nib. In this class I’ll show you how to achieve these styles without losing the thin and thick look. The lettering above and below were done using brush markers. You’ll leave class with a fun new skill that can be used to bring a flare to any project. This is a beginners class. No previous experience in lettering skills are required. All class supplies will be provided for you and are included in the class fee. You just have to show up! I’m happy to share the dates for my September calligraphy classes! I will be offering two calligraphy 101 classes and a brush lettering class. 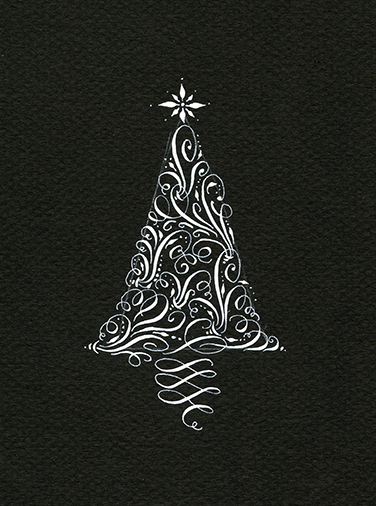 In November I will offer the Calligraphy 2.0 class for anyone who would like to expand their calligraphy skills. Come join in the fun! Now that you’ve learned the basics it’s time to dive in deeper! Come expand your calligraphy skills in this 4 hour advanced class. We will look at working with colored inks, intro flourishing, modern variations and overall composition. It’s time to take all of the practice you’ve been doing with traditional calligraphy and expand your letterforms in new modern ways. 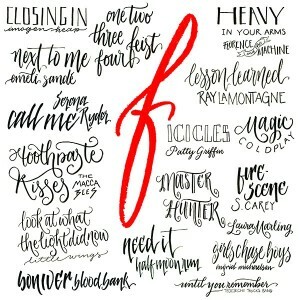 We’ll look at edgy to romantic scripts as well as how to draw banners and other foliage to accent your calligraphy. I’m excited to announce I’ll be teaching two brand new classes in June 2014! I’ll also be teaching my Calligraphy 101 class. Please see below for more information. This class will be a one day workshop from 3pm-7pm. Hey everyone! 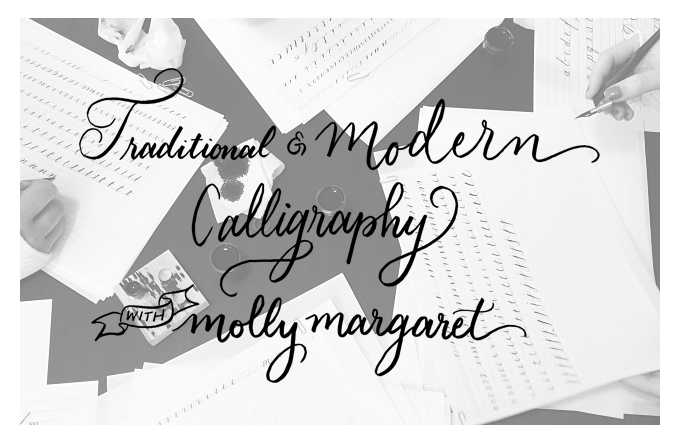 I’ll be teaching my Traditional and Modern Calligraphy Class on Saturday, May 10th. This is a last minute announcement so please secure your spot quickly. See below for more info about the class and registration….